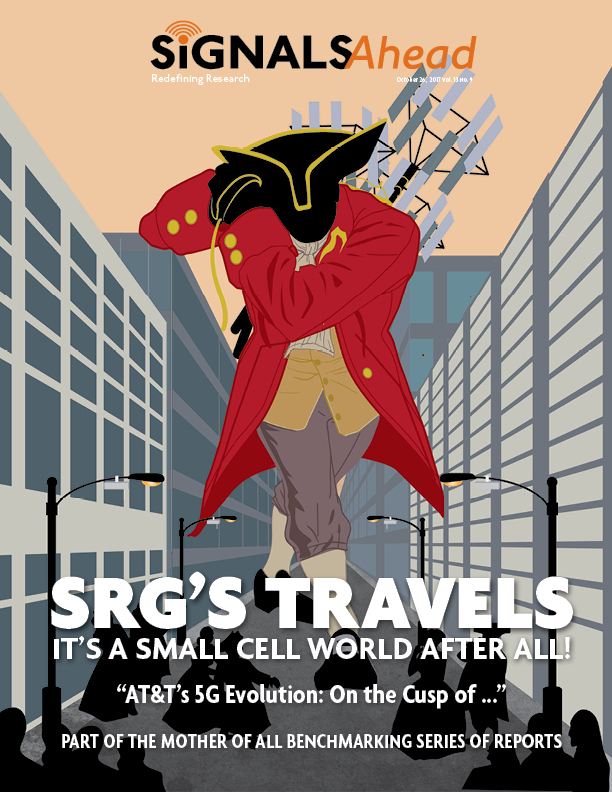 SRG Travels: It's a Small Cell World After All! In this Signals Ahead report we provide results from our independent and in-depth analysis of LTE small cells, specifically LTE-FDD small cells that have been deployed as part of AT&T’s 5G Evolution in Indianapolis, Indiana. We also include an overall assessment of the network performance. Our Approach. We tested AT&T’s “5G Evolution” in downtown Indianapolis – once in May (before small cells) and again in September (after small cells). We used geo binning of the data, filtered the results by EARFCN, separated the results between macro and small cell PCIs, and used RB normalization to provide the most meaningful analysis of the data. The Small Cell Results. We identified material/substantial benefits in downlink and uplink performance, including all of the underlying performance metrics that influence user data speeds. We quantify these results and provide the relative impact on user data rates and spectral efficiency. We also analyzed the impact of interference. The Macro Network Results. We’ve tested all the network features, going back to 1H/2015, but for completeness we include them in this study.